Magerealm has come a long way since its release thanks to the support of our wonderful players. Many of you have been asking for more thrilling guild events and we want you all to know that your voices have been heard! 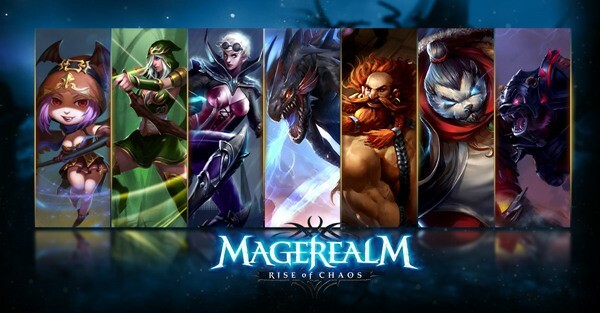 We are happy to unveil the next exciting feature coming to Magerealm - Turf War! Different from PvE focused content like Guild Boss and more causal events like Pool Party, Turf War is the first time guilds will confront each other in the ultimate battle for dominance! Players must protect their guild’s territory while laying siege to rivals as they strive for power and glory. Guilds are set to clash head-on to determine which is the best in the Realm. This is Turf War! In Magerealm, each guild enjoys its own secluded domain that is off limits to outsiders. However, there is no such comfort in Turf War. Guilds will be given a piece of territory, or “turf”, that is wide open to invasion from other guilds. Each member of a guild will be tasked with overseeing their own stronghold within their guild’s turf. Members must defend their strongholds while assaulting those of rival guilds. If a player can successfully break through their opponent’s stronghold, they can reach the inner city and gain victory points for their guild. In Turf War, it is not wise to simply attack strongholds at random. Players should choose their opponents according to their own strength. Each stronghold will have a Star rating to give attacking players a better idea of what they will be up against. Attacking a 1 Star stronghold means the attacker has an advantage in terms of Battle Rating. 2 Star means the BR of the attacker and defender are roughly equal, while 3 Star strongholds will be the most difficult to take down, as the defender has the BR advantage. Use the Star rating to gauge enemy strongholds and take the best course of action. Every member will have an important role in how their guild fares in Turf War. Anyone with the will to fight and compete has something to contribute. For each battle, players will earn 3 points for victory, 1 point for a draw, and 0 points for defeat. Points earned by all members will be tallied to determine their guild’s rank in Turf War. There is also an individual ranking to show the top combatants of the guild and encourage some healthy inter-guild competition. 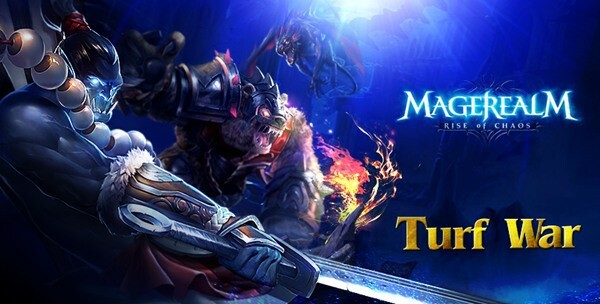 Guild vs Guild warfare has finally come to Magerealm! Stand strong alongside your comrades and battle for honor and glory!